When Owl City hit No. 1 with the massive song Fireflies, Adam Young, the track's DIY creator, was immediately tagged as an all-too-close (OK, some called him a rip-off) sound-alike of The Postal Service (Death Cab For Cutie's Ben Gibbard's electronica side project). But Young isn't letting the slags ruin what he describes as "an incredible, totally surreal experience." After all, it wasn't long ago that the 23-year-old was working menial jobs and living in his parents' basement in Owatonna, Minnesota, where he recorded music on his own and put it on MySpace - like so many other hopefuls. 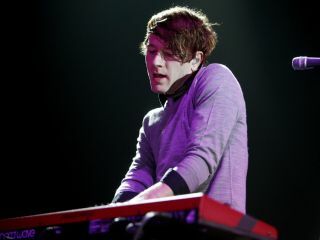 Young's first Owl City recordings, the 2007 EP June and 2008's full-length Maybe I'm Dreaming, received a fair amount of viral buzz, but last year he released the album Ocean Eyes, and from the minute people heard the oceanic, bubbling intro to Fireflies (face it: it's infectious, whether you think it sounds like The Postal Service or not), Young's success was made manifest: he signed a deal with Universal Republic, and Fireflies became iTunes' most-downloaded song ever. While still defending himself against rip-off comparisons - Young admits to being a Death Cab fan and says he only got into The Postal Service once the fuss started - the Minnesotan is taking Owl City on the road with a full band and living out his basement fantasies before packed houses. MusicRadar caught up with Young on tour recently, where we asked him how it feels to go from total obscurity to worldwide acclaim in the span of mere months. We also talked gear and, yes, asked him about those pesky comparisons. The Owl City man is a funny bird to pin down: one second he's open and honest, the next he's cagey and snarky. But he's certainly an original...even if people think he sounds like, well, you know. You recorded your first albums in the basement of your parents' house. Was that as lonely and depressing as it sounds, or did you have an upbeat feeling that you could 'make it'? "It was almost more fun than I could handle. I was writing music for no one's ears but my own. I was my own worst critic and never was the process lonely or depressing. It was really entirely the opposite. I feel like I have a lot more purpose behind writing songs these days, but being an independent artist was really a wonderful thing." What did your parents think of your direction in life at the time? You were living at home and working at a Coca-Cola bottling plant and then at UPS. Did they push you to do something else and give up this 'silly music thing'? "They were very supportive, although I think they secretly thought I was a bit of a mad scientist at the time. They are incredibly excited for me." Did growing up in Minnesota shape your view on life in a way that you see it influencing your music? "Yes and no. There was never much of a cultured music scene where I grew up, so I sort of had to invent it for my own. I imagined music being this or that without having any idea that it did, in fact, exist somewhere out there - and in a lot of places, ironically." Now that you've had a No. 1 single, what's been your parents' reaction? What kind of music did you grow up on, and how has it informed the style of music you're making now? "I listened to a lot of experimental music, quite a bit of ambient wordless material. I am very fond of film scores and music written for movies that stands up on its own. I write and record a lot of instrumental abstract music and that's really where my heart lies." Did you join bands as a teenager, or were you pretty much on your own, doing the 'singer-songwriter' thing? "I was in a couple different bands as a drummer and never struck out to do the singer-songwriter thing, other than finding the idea of doing everything myself - via writing and recording - very intriguing." "I discovered the endless capabilities of samples and sequencing and knew I needed to get myself a DAW." How did you study up on gear and figure out what kinds of equipment to buy to build your basement studio? "All of it is done in the box, so to speak. I discovered the endless capabilities of samples and sequencing and knew I needed to get myself a DAW." How long does it take you to come up with an intro and the layering of instrumentation? Does it take you a while to find the right musical bed? "Some songs are different than others. They say a good song is never written, but 'caught' like a fish." Does writing come easily to you, or is it a difficult and painful process? "Some songs basically write themselves and it's like I'm the only one around to claim and record them. That's how a lot of my albums are written." You seem to favor soft, bubbling intros. Any ideas for changing that up in the future? Can you see yourself starting out with a crashing chorus, say? The songs Hot Air Balloon and The Saltwater Room features some nice acoustic guitar sounds. What kind of acoustic do you use? How would you rate yourself as a guitarist? "I used my uncle's old '69 Alvarez. I am by no means a very good guitarist but I have a lot of fun layering things together." For a guy who describes himself as "shy" and "a loner," you seem very comfortable on stage. Are you? "I always imagined what it would be like to perform on stage in front of a lot of people, and as a result, usually became nervous at the idea as well. Performing becomes easier as you do it. I still get butterflies." Does the sound of a live band - with live drums especially - excite you as much as creating at home? "There are a lot of things to appreciate about both. I think I favor the studio a bit more." How does your live setup differ from what you use at home? "I play a lot of hardware live, a Nord Wave and a Moog Voyageur. At home I sequence everything in Pro Tools." Like so many people, you started putting your music on MySpace. But yet, you hit a nerve and people reacted big-time. Why do you think you struck gold - well, platinum, really? "Ask me that in 20 years. I honestly have no idea. It's incredible. Totally surreal." What about pitch correction on your vocals What do you use? OK, Fireflies....No. 1 smash. How does it feel - like you've cracked open the door for more, or do you worry about it becoming a one-hit wonder? "That song is funny. It kind of wrote itself. I'm honored that so many people seem to connect with it." What was the inspiration for Fireflies? It doesn't sound like something that a guy in Minnesota would come up with. "This one time I went to Taco Bell and got a grilled stuffed burrito and some cheesy fiesta potatoes. It was awesome. Then I went home and wrote Fireflies." What's a bigger thrill - having Fireflies go to No. 1, or having it featured on Kidz Bop 17? "One time I heard my song in a toolbox factory in Iowa on a really crappy boombox with a screwdriver stabbed into one of the speakers." I have to ask about the early slamming you got from some critics, especially Pitchfork, comparing you to The Postal Service. Unfair? Do you hear why they might lump you together? Are you totally sick of the comparisons and wish people could just move on? "My dad totally used to be a mail carrier and he got to drive around one of those sweet trucks with the steering wheel on the wrong side."